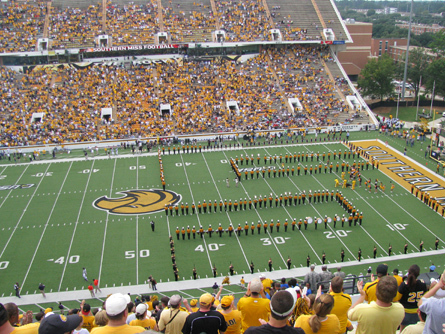 Virginia college football doesn’t often come to Mississippi, but this Saturday the Cavaliers traveled to the University of Southern Mississippi to play the Southern Miss Golden Eagles. 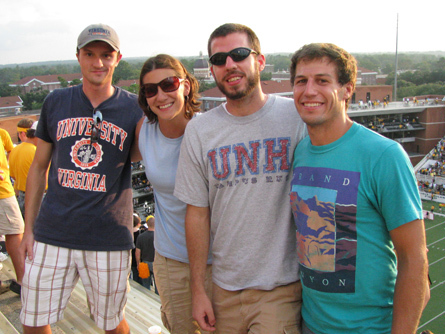 Along with non-UVa-fans Doug, Anne, and Jesse, I went up to Hattiesburg for the game. We met some Biloxi friends right by the stadium for a tailgate before the game. After leading 27-10 at halftime Virginia managed to choke and lose it 34-37. But I had a good time cheering for my team (along with tens, nay twenties of other Cavalier fans) and enjoying the experience of college football game day. College football game day... woo! Sports photography... from the top of the bleachers. #10 Jameel Sewell (QB) hands the ball off to #21 Dominique Wallace (RB). 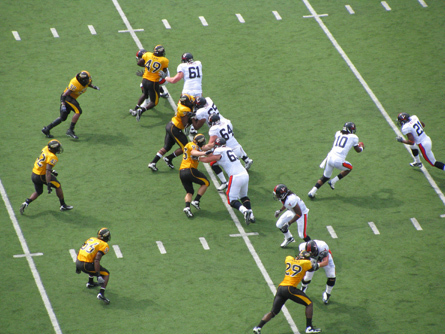 UVa outscored Southern Miss 27-10 in the first half but Southern Miss came back to score 27 points in the second half. 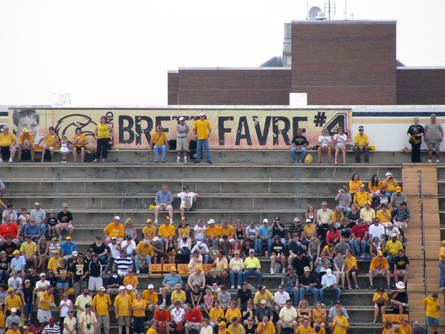 Brett Favre #4. Southern Miss alum and Mississippi's favorite son. Also my backup fantasy QB. Great shot from the top bleachers! What kind of lens did you use to get that shot? Thanks! Nothing special, just the 10x zoom on my Canon PowerShot SX100.